Each week, Tehachapi News publishes a list of civic meetings to help the public get involved in local decisions. Fathers, sons, mothers and daughters all became anglers at Saturday's Tehachapi Valley Recreation & Park District's Brite Lake Fishing Derby. A Tehachapi student will appear on the CBS game show "The Price is Right" as part of the network's Kid's Week special. A benefit dinner held April 9 to raise funds for a planned $3 million imaging center at Adventist Health Tehachapi Valley brought in significant contributions. 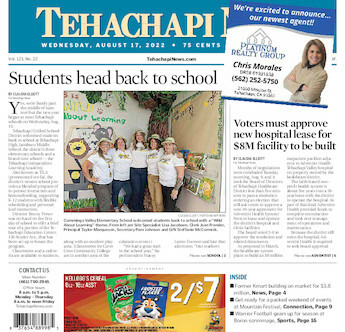 Each week, Tehachapi News publishes a list of civic meetings to help the community get involved in local decisions. Disasters can happen at a moment's notice and to prepare, the city of Tehachapi has approved a formal Operational Area Disaster Response Mutual Aid Agreement to make resources, equipment and personnel available to help communities surrounding Tehachapi in the event of an emergency. The Tehachapi Police Department arrested 14 people on suspected misdemeanors and five people on suspected felonies during the week of March 25-31. Staff from the office of Rep. Kevin McCarthy, R-Bakersfield, will hold an office hour in Tehachapi on April 16. Two Coffee with a Cop events will take place Tuesday, April 16, offering people the change to learn about the new Ring security camera partnership and subsidy program that launches April 17.